OK, my repeat time course worked nicely, and I can compare how wildtype cells develop competence in rich medium and in defined media with and without a purine source. 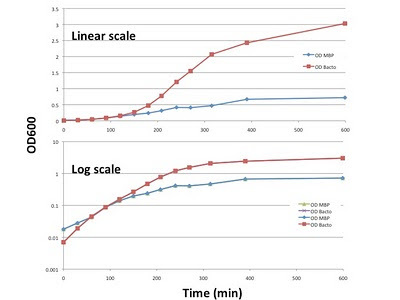 The defined medium is the 50:50 mix of the RPMI-based and cMMB media. 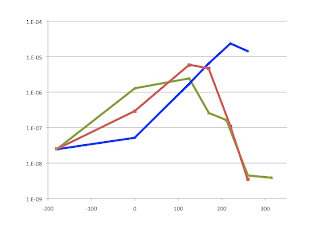 The first graph shows growth of cells in the three media. They all started from equal aliquots of cells that had been pregrown in the '- inosine' medium and frozen. We see that the cells in the defined medium with inosine grew almost as fast as the cells in rich medium, but they stopped growing earlier and began to die. 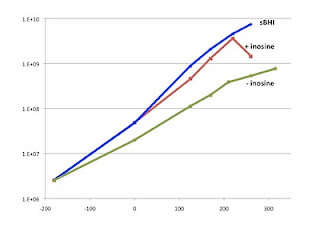 The cells in medium without inosine grew slower. You can't tell from this graph, but they didn't get much more dense than the final point shown here. 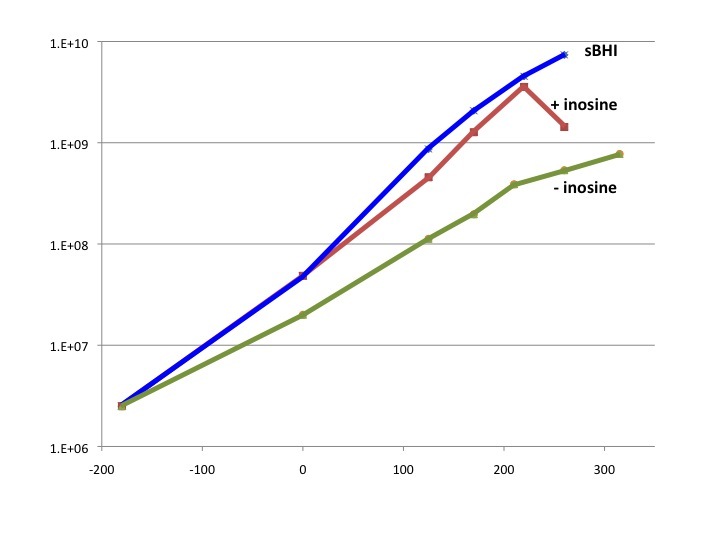 The blue line/top panel is control cells in the rich medium sBHI. They behaved normally, giving a maximum transformation frequency of about 10^-5 when the culture got moderately dense, and an MIV-induced transformation frequency of about 2x10^-3. 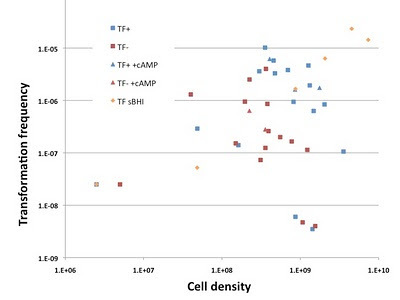 Note that the cells were barely competent at all when at low density (TF 5x10^-8). The red line/middle panel is cells in the defined medium plus inosine. 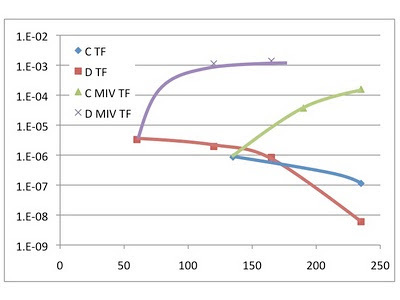 At t = 0 min these cells were 5.5-fold more competent than the control cells (TF 3x10^-7), although the growth curves show that both cultures were in log phase growth. They were also about 3.5-fold more competent at the next time point, but then their transformation frequency began to decline while they still appeared to be in log phase, and at the last time point there were no transformants at all. Transfer to MIV made them about twice as competent as the control culture, consistent with Ranhand and Herriott's finding that pregrowth in medium with lots of inosine enhances subsequent competence development in MIV. The green line/lower panel is cells in the defined medium with no inosine. These cells became even more competent in log phase than the cells in medium with inosine did, with TF 25-fold higher than the control cells. But they didn't get more competent as density increased, and their competence started falling while their density was still much lower than that which gave maximum competence in medium with inosine. The second-last time point gave only a single transformant, and the last time point gave none. 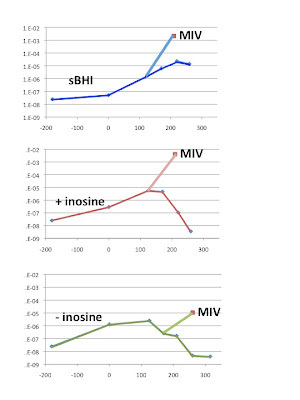 Transfer to MIV did increase competence, but to a level about 200-fold lower than control cells and 400-fold lower than cells with inosine, about 10-fold lower than I saw last time. 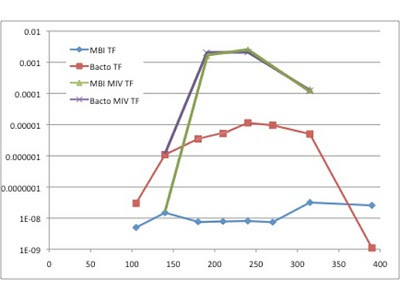 The increase was only about 40-fold relative to the cells at time of transfer, whereas the others had MIV-induced increases of about 1000-fold. I should test the effect of adding cAMP to the cultures in defined media. The media contain some glucose, but no fructose, so our simple model of competence regulation predicts that the PTS will have activated adenlyate cyclase, producing high cAMP levels. However a former PhD student found that adding physiological concentrations of fructose to rich medium and to MIV had no effect on competence development. Inosine is a nucleoside, the base hypoxanthine attached to a ribose sugar. Amy's chart shows that inosine cannot be directly converted to IMP and then to AMP and GMP. Instead the sugar must first be cleaved off, and the resulting free hypoxanthine is then converted directly to IMP in a single step. So use of inosine as a purine source creates hypoxanthine in the cytoplasm, which could accumulate to high enough levels that it represses the purine biosynthesis pathway by binding to PurR. I don't think we've ever tested other purine sources. Ranhand and Herriott found that deoxyinosine had the same competence-stimulating effect as inosine, and that hypoxanthine and ribose were ineffective. My wildtype H. influenzae cells seem to grow reproducibly in the 'RM' medium that's a mixture of two published defined growth media RPMI and MMB (neither of which gives reproducible growth in my hands). But I'm not entirely happy with this medium yet, for several reasons. One is its arbitrariness, its lack of a scientific rationale. Is it unnecessarily complicated? Because I don't know why it works, I don't trust it. The other day I tried making a more streamlined version of it, supplementing RPMI with each of the components that distinguish MMB from it (glutamic acid, glutamine, glutathione, higher concentrations of vitamins), but the cells didn't grow at all. Another is that I haven't yet tested whether H. influenzae cells can grow indefinitely on it. So far I've been starting each RM culture with cells that have been grow in in rich medium. Today I'll start cultures from cells that were grown in RM. But inoculating liquid cultures from liquid cultures is not a very good long-term test, because contamination can creep in. What I really need to do is to make agar plates of RM (or whatever defined medium I want to test, streak cells on them, and pick single colonies for continued growth in RM broth. But to make RM agar I either need to have a 2-fold concentrated RM liquid to which I add a 2-fold concentrated solution of agar in water, or I need to autoclave the RM liquid with powdered agar. But the ingredients of RM take up too much volume - I can't make it 2-fold concentrated. (I could buy some RPMI powder rather than the ready-to-use solution I have now...) And I'd rather not autoclave it, as I suspect it's not entirely heat-stable. Today, in addition to my time course of competence in sBHI and RM ± inosine, I'll try to fit in more medium tests. On Thursday I did a competence time course for wildtype cells growing in a defined medium with and without a purine source. The medium was a 50:50 mix of the RPMI-based medium and the MMB medium with glutathione, because that's the only medium where growth has been reproducible. I'll call it RM medium for now. 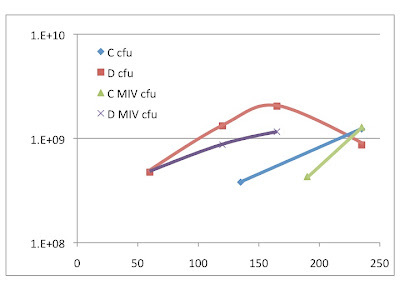 The first graph shows growth of the cells; C is medium without inosine, D is medium with inosine. There aren't many time points for two reasons. First, the cells initially didn't grow from an overnight-culture inoculum - I'm going to solve this for future experiments by freezing vials of cells already in log phase in this medium. Second, I was planning to also test cells growing in plain MMB medium ± inosine, but they didn't grow at all. Time zero on the graph is actually 4 hours after the cultures were inoculated. The red and blue lines are the cells in RM medium with and without inosine respectively, and the purple and green lines are cells transferred from these cultures into the competence-inducing starvation medium MIV. 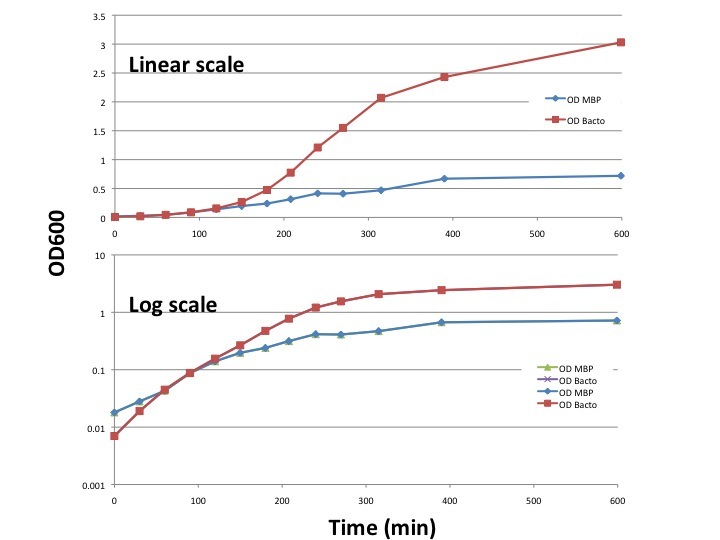 There's not much to learn from this graph on its own - the cells are growing in the RM medium, but slower and to lower densities than they would in the rich medium sBHI, and they continue to divide once or twice in MIV, as we see with sBHI-grown cells. The second graph shows how well these cells transformed. The first surprise was that the cells were quite competent at the first time points in RM (red and blue points). 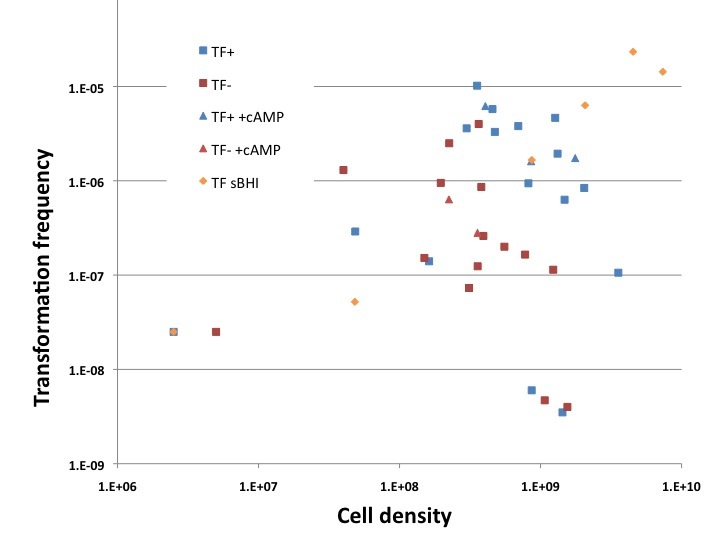 Cells at these densities (well below 10^9 cfu/ml) in rich medium would not have given any transformants at all (TF < 10^-8), but in RM medium the transformation frequencies were close to or above 10^-6. These cells had been growing in this medium for at least 5 hours at these sample times, so I think this is probably a real log-phase competence, not a carry-over from the overnight's stationary phase. The second surprise was that, as the cultures in RM got denser their competence decreased rather than increasing as it does in sBHI cultures. 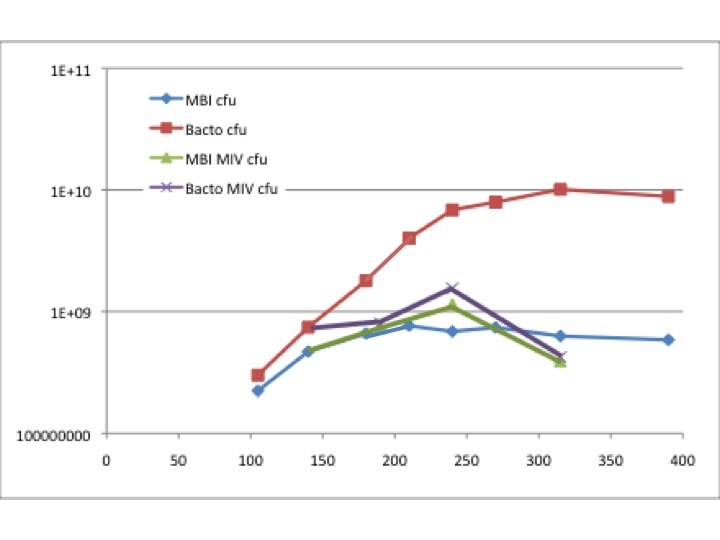 The third surprise was that the cells growing in RM + inosine became much more competent after being transferred to MIV. Cells grown in sBHI are expected to do this, but competence development hasn't been examined in either the RPMI-based medium or in MMB. Many years ago (1970) Roger Herriott reported that H. influenzae cells grown in a defined medium called MI wouldn't become competent when transferred to MIV, and he developed a modified defined medium called MIc that did allow subsequent competence development in MIV. 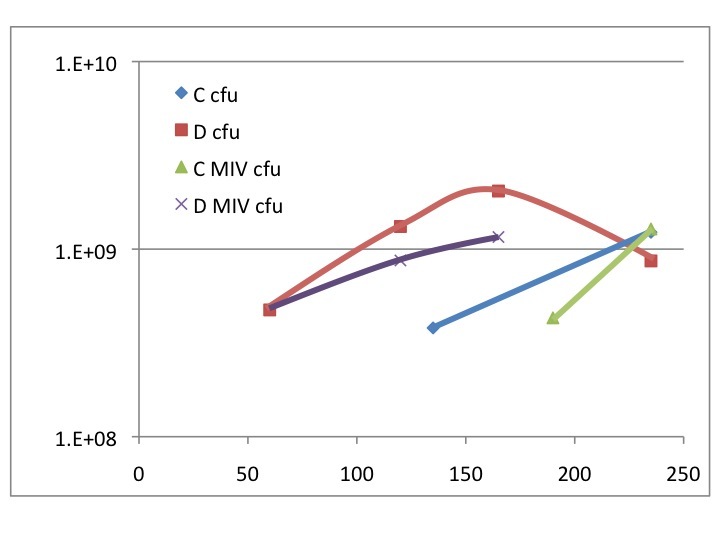 More surprising was the high competence induced by MIV in cells that had been growing in RM without inosine (green line). MIc and the other published defined media for H. influenzae include a high concentration of inosine (even though we now know it's not required for growth), because Ranhand and Herriott had previously found that adding inosine and lactate to a defined medium promoted subsequent competence development. And our thinking about the regulation of competence has been influenced by this. 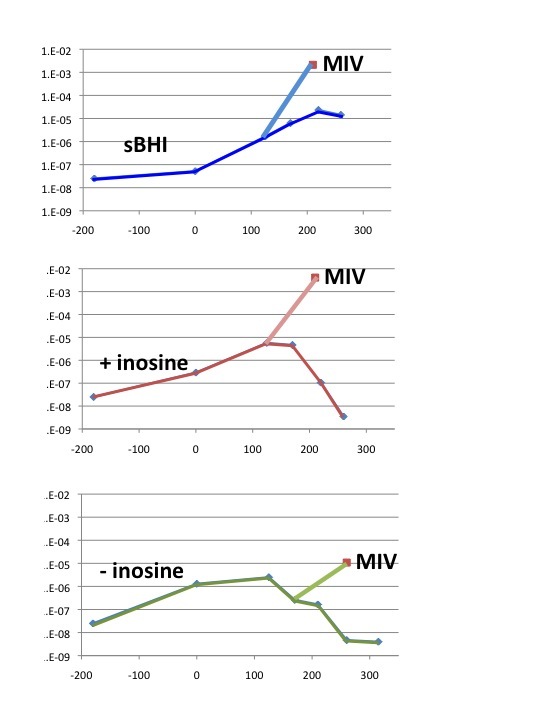 I don't think we've ever tested how inosine in the growth medium affects competence in MIV, but I expected to see little or no competence induction, rather than the 3-4 logs the graph shows. Tomorrow I'll repeat this time course, including cells in sBHI as a control, and sampling more time points, especially early in growth. I'll start these new cultures with my frozen RM-grown cells. After epic faffing around with various defined media*, I finally have clean results confirming that wildtype H. influenzae can grow without added inosine but our new purH mutant can't. (Although, given how much variation I've seen in growth in different versions of these media, I still need to confirm this result at least once more.) So now it's time for some serious thinking about what experiments to do. One goal is to find out whether the rec2 gene is indeed repressed by the PurR repressor. In the purH mutant, PurR doesn't affect synthesis of purine nucleotides, and thus shouldn't affect competence in other ways. Once we have a properly confirmed purR mutant (we're still waiting for the sequences), we'll test the purH mutant and the purR purH double mutant for competence. We should probably do this both under conditions where expression of other competence genes is as high as it can be, and where expression of other competence genes is limiting. So first we should test competence during growth in rich medium and after full induction by MIV; we could also add cAMP, test hypercompetence mutants, test defined medium. We also should do more-or-less direct tests of rec2 expression levels with and without PurR. Doing these in the purH mutant background will eliminate the proposed regulatory effects of purine nucleotide synthesis. And now I think I can also start using defined media and the purH knockout to investigate the proposed regulatory effects of purine nucleotide synthesis. The defined media for H. influenzae typically contain lots of inosine because, many years ago, it was discovered that cells transferred from a defined medium to starvation medium didn't become very competent unless the defined medium had contained lots of inosine. But nobody had followed this up as a component of competence regulation. But I can, now that I have cells growing well in defined medium with and without inosine (and no other purine source). If I transfer wildtype cells from cMMA ± inosine to MIV, do they become competent? Do cells become competent at all when growing in cMMA ± inosine? How competent are hypercompetent mutants growing in cMMA ± inosine? I guess the first step is to do a time course of growth and competence of wildtype cells in cMMB ± inosine, including transfer to MIV. Better go pour some plates. * and discovering, when I went to put our new 500 mg bottle of glutathione away, that we already had a 10 g bottle that I'd somehow overlooked. The RA has finished making our purH knockout mutant. The PurH protein catalyzes the last common step in de novo synthesis of purine nucleotides, so this mutant should be entirely dependent on purine salvage for growth. It grows fine on agar plates, and yesterday I tested its growth and competnece development in broth. The colonies are still too small to count so I won't have numbers until tomorrow, but I can tell that its growth rate and levels of competence are not dramatically different from wildtype. Today I'm going to make up some defined medium with and without inosine as a source of purines for salvage. I predict that wild type cells (and the purR mutant) will be able to grow without inosine but that the purH mutant will not. On Monday we should get the sequences of our various purR mutants, and then we'll be able to decide how to proceed with them. Later: Curses! The defined medium recipe calls for glutathione (a tripeptide). I thought we would have some in the lab from the last time I made this medium (years ago), but I can't find any. And it's expensive (~$160 for 500 mg)! We've already modified the medium recipe by adding casamino acids, so I'll try just replacing the glutathione with extra casamino acids. Next day: Damn! Neither the purH mutant nor the wildtype control grew in the defined medium, with or without inosine. Maybe they really need the glutathione, or maybe I left something out. I don't want to spend all that money getting some glutathione, so perhaps I'll try the older defined medium (Herriott et al. 1970), or maybe I can scrounge a bit of RPMI tissue culture medium from a colleague and try the new-fangled medium (Coleman et al. 2003). Well, our manuscript on uptake sequence variation has now been accepted by Genetics. This is the long-established and highly regarded journal of the Genetics Society of America, so we're pleased. While sorting out confusion about page charges and open access I discovered that, as of this year, Genetics is published on-line only (no paper issues). That's a reasonable response to the dwindling market for paper journals (I can't remember the last time I looked at a paper copy of a recent issue). And it lets them dispense with any extra charge for colour figures. But this doesn't mean that Genetics is now open access. It's still subscription-only access for the first six months after publication, unless the authors pay a $1200 open-access charge on top of the $88 charge per published page ($70 for GSA members) and $250 charge for up to 5 pages of supplementary material. GSA membership costs $120, plus an additional $120 if you want an online subscription to Genetics (if you don't have access to an institutional subscription). So if our article runs 10 pages, we'd break even on a membership. The ever-efficient RA has used recombineering in E. coli to make a knockout of the purH gene, and has transformed it into H. influenzae. So now we can start investigating its phenotype, alone and in combination with other mutations. We should probably confirm the purine defect by showing that it can't grow in a defined medium unless a purine is provided. The purH gene encodes the protein that carries out the last common step in de novo purine biosynthesis, so knocking it out prevents the cells from synthesizing any purines. If cells in rich medium indeed get all their purines by salvage, then the purH cells should grow normally in sBHI and develop normal late-log competence. They may also have normal MIV competence, depending on whether de novo synthesis affects induction of sxy or survival in MIV. We can also use the purH mutant to cleanly test whether PurR represses the rec2 gene, because we won't have to consider confounding effects of purine pools on sxy-regulated expression of rec2. If it does, then there should be more rec2 mRNA in a purH purR double mutant than in a purH mutant. We can measure this by quantitative RT-PCR and maybe using our rec2:lacZ fusion strain (if the antibiotic resistances aren't the same). This is an important experiment because finding that PurR represses rec2 would be the first clean implication of purine pools in competence regulation. It also would let us do cleaner analyses of how purine pools affect sxy expression. The RA found a stock of our original purR::kan knockout strain (made 10 years ago) and showed by PCR that it had the expected disrupted purR gene. So I've been checking its competence phenotype. 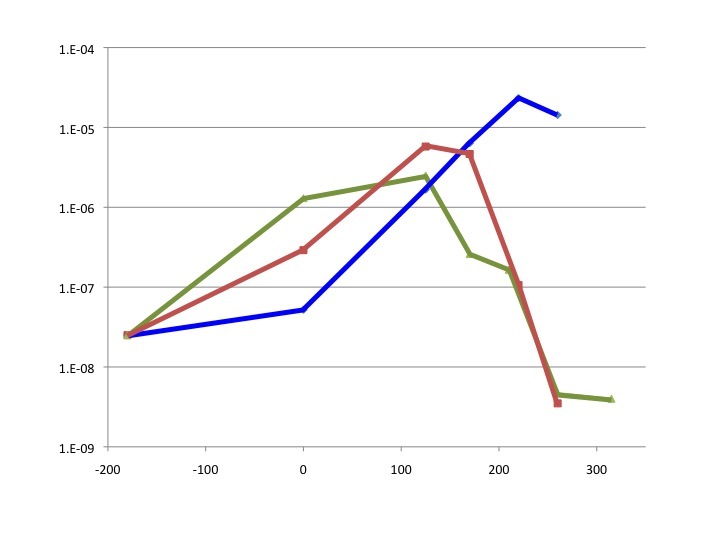 The original phenotyping (done 10 years ago by the grad student who made the mutant) found that the purR mutant strain grew normally and developed normal competence in the starvation medium MIV and had a slight reduction (maybe 7-fold) in how competent it became at high density in rich medium (I'll use the term "late log" for this growth condition even though the cells are not in log phase). I expected this to be reliable information because the grad student was very careful, and I've now confirmed it, finding normal growth, normal MIV competence and about a 10-fold reduction in rich medium. At present the 10-fold reduction in late-log competence is the only way this mutant differs from wildtype. That's too bad, as it doesn't give us much to work with genetically. But now I suspect that this strain may indeed have a purR defect, because it had a stronger version of the late-log competence defect (~100-fold). So I think we need to find out how this strain differs from wildtype and from the purR::kan knockout. The RA suggests sequencing its wildtype-sized purR PCR fragment to see if this carries any mutations, and using inverse PCR to sequence outward from its kan cassette to find out where it is in the genome. I hope that these analyses will show differences that give us some insight into what causes the phenotype. The Biochemistry and Molecular Biology panel only funded the top 8 proposals out of the 47 they received, but we were ranked #10. I'm going to talk with a grants administrator there to see whether we should submit the revision to a different panel. But she's away until next week. I'm also trying to get in touch with someone at CIHR who can give us permission to use of $50,000 of our current operating as co-funding for our Genome BC award.